Post Cards by Photographers Jonathan van Bilsen & Glenn McGeorge available at the Chamber of Commerce office 237 Queen Street! Port Perry along the shores of Lake Scugog, is a magical place to visit in any season! Be transported to another place and time like a Dickensian dream. With a downtown Queen Street Victorian style village that holds everything from festivals to farmer’s markets, pubs to patios, fashion to furniture, and even a new brewery. 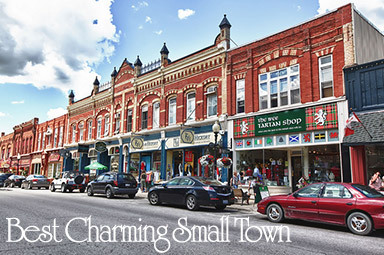 Port Perry is known in the area for its picturesque, Victorian-era downtown, with many clothing stores, restaurants, cafés, bookstores, galleries and antique shops. 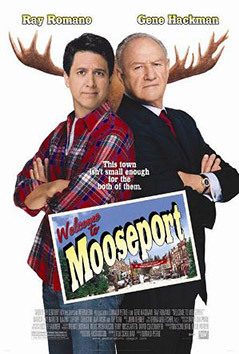 In the summer, the town features a number of festivals, including the Mississauga First Nation PowWow, the Highland Games, the Dragon Boat Races and StreetFest. Its annual fair, held every Labour Day weekend, has been running for over 100 years. There are also numerous golf courses, both public and private. Other attractions in Port Perry and surrounding area include the Great Blue Heron Charity Casino, Scugog Memorial Library (featuring the Kent Farndale Art Gallery), the Scugog Shores Historical Museum and the Town Hall 1873 -Centre for the Performing Arts. At many local farms, visitors may pick their own seasonal fruit (strawberries, raspberries, apples). In the summer, scenic cruises on Lake Scugog are also featured. The Lake Scugog town shoreline offers two popular lakeside parks, Palmer and Birdseye. There are active fishing seasons, both winter and summer. 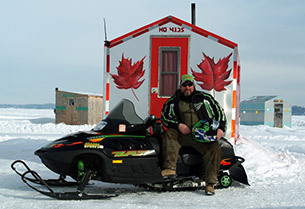 In the winter months, Lake Scugog is dotted with ice-fishing huts and is a popular destination for both ice fishermen and snowmobilers. Town Hall 1873, as shown in Ralph Nogal’s Photography is the centre for performing arts in Port Perry, often featuring Borelians Theatre Company’s Productions. Whether enjoying local artists work like Joanna Malcolm, featured with many artists on the Lake Scugog Studio Tour, taking in Scugog Council for the Arts Exhibits, or purchasing Ontario made artistic treasures to take home with you, such as at Meta4 Contemporary Craft Gallery, let your senses be stimulated! For all kinds of local attractions including winery, casino, dinner cruise, golf, raceway, water park, local restaurants and more… see Attractions! Feeling the winter blahs? Terrific photos of day 99 of a 365 day portrait of Canada in “Canadian Mosaic” featuring Port Perry ice fishing! See Attractions link for area winter activities especially at Christmas with carriage rides, Santa Claus Parade, Midnight Madness shopping and more! Brides win amazing prizes in Forever Friends Bridal Wars, not to mention find amazing gown at Forever Friends or at Everlasting Memories. Why not have a unique wedding in our community? 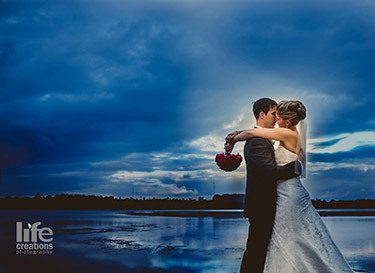 Think about Trillium Trails Banquet and Conference Centre with a ceremony by their pond and reception all in one place or Nestleton Waters Inn, which offer complete destination wedding packages including a marquis by the water! Whatever your reason to stay, whether business, sport, B&B, or a romantic wedding, Port Perry’s the place!